Mrs. Ila Shrestha (Pradhan) had received her M. Sc. Degree in Botany in 1987, and Ph.D. in Ethnobotany in 2009 from Tribhuvan University, Dr. Shrestha is working as an Associate Professor at Patan Multiple Campus, Tribhuvan University since 23 years. She has also gained experience of 8 years as an Assistant Botanist in National Herbarium and Plant Laboratories, Godawary, Lalitpur, before joining University job. 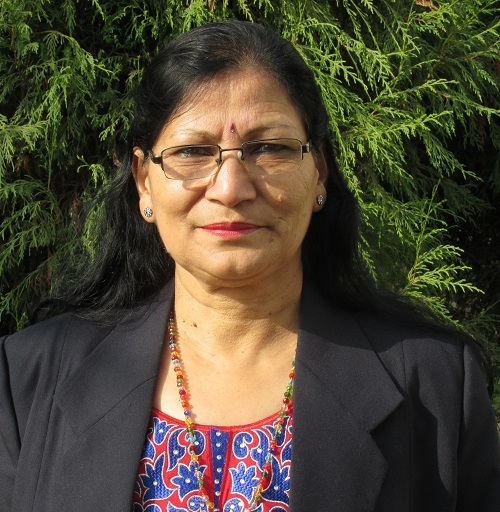 In addition to her academic involvement, she has been professionally involved in the field of ethnobotany, biodiversity and natural resource management since 1986 affiliated with different NGOs of Nepal. She had conducted projects on the cultivation of medicinal plants and has research experience of working on several projects supported by Plan International / Nepal collaborated with SOCODEP, UMN, ICIMOD, Tribhuvan University, etc. She has published more than 25 research papers on ethnobotany and taxonomy, published in national and international journals. Currently, Dr. Shrestha is the Chairperson of Society for Community Development Professional (SOCODEP), General Secretary of Ethnobotanical Society of Nepal (ESON) and Life member of Nepal GIS Society, Nepal Botanical Society and Center for Nepal Environment and Education Development.